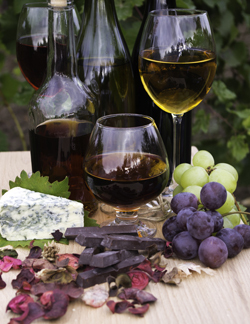 The clarification process that occurs in wine-making is called fining. This process filters the wine by using such substances as albumin (egg whites), casein (milk protein), gelatin (animal protein), and isinglass (fish bladder protein). While we could write up the full definition of Fining Wine here, let's just say that without this process, wine would appear cloudy or murky rather than crisp and clear, and that would make for some unhappy wine connoisseurs. Fortunately, many winemakers are beginning to use vegan-friendly clay-based fining agents like bentonite or activated charcoal. This is great news for vegan wine lovers everywhere! Even though most winemakers don't list fining agents on their label, Barnivore.com has compiled an online directory of vegan and vegetarian beer, wine, and liquor! So, if you are a vegan, and you also happen to be a wine-lover, head over to their website and check out their list of vegan-friendly wines.